"SON of Alladin", a 90-minute 3-D film released in the US a couple of weeks ago, was released in Chennai in September-end. The movie, from the house of Chennai-based animation giant Pentamedia Graphics, is expected to get a worldwide release soon. According to Pentamedia Vice-President Sumathi Sridharan, the company plans to have at least one million cassettes of the $3.5 million film in the video market. Each videocassette is likely to be priced at about $7. "Son of Alladin" is the fourth animation film from the $200 million company, which made "Alibaba" that got 17 Oscar nominations. 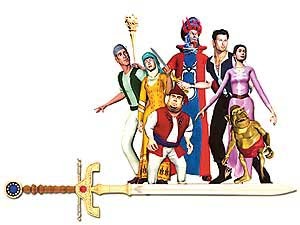 Pentamedia also did the pilot for the series "Excalibur" with Griboulle in France. An action movie, "Son of Alladin" is an animated takeoff on the story of the universally popular Alladin and his magic lamp. "The 3-D medium is very dynamic in terms of the flexibility it offers production teams," said Sridharan. Director, story and screenplay writer, 72-year-old Singeetham Sreenivas Rao told IANS: "We do not know how much acceptance there will be in India for such animation films. I have done a lot of live-action films. Here we have used the motion capture technique", he explained. Animation director Riyaz Babu N.S. said: "The film with 1,100 shots took nine months to make." There are as many as 125 characters in the film. The background visuals and sets are stunning. But the trouble is the lip movement, which is not in sync. Pentamedia’s first feature film was "Sindbad—Beyond the Veil of Mists". It was followed by "Pandavas" and "Alibaba".